Stomach, Glandular stomach - Foreign body in a male B6C3F1 mouse from a chronic study. 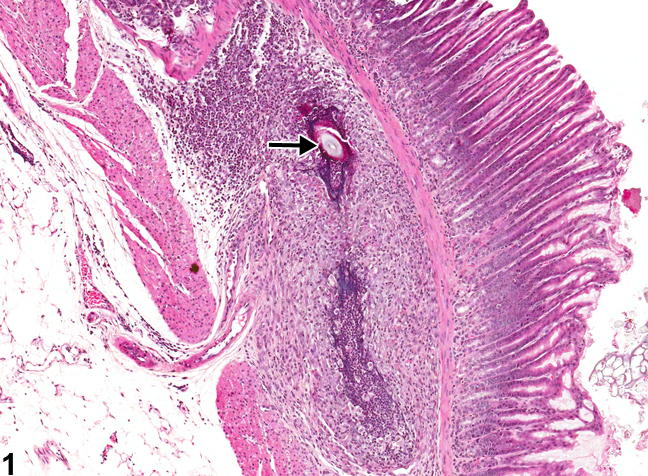 There is a foreign body (arrow) in the submucosa with secondary inflammation. Stomach, Glandular stomach - Foreign body in a male B6C3F1 mouse from a chronic study (higher magnification of Figure 1). 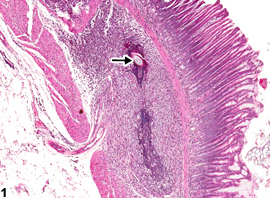 There is a foreign body (arrow) in the submucosa with secondary inflammation. Hair ( Figure 1 and Figure 2 , arrows) or feed material can become embedded in the wall of the glandular stomach secondary to injury from a gavage procedure or ulceration from xenobiotics. The process of ulceration exposes the underlying propria and muscular wall to gastric contents and allows hair and food material to penetrate into the granulation tissue, which forms beneath the ulcer. A primary foreign body should be diagnosed but not graded. If a foreign body causing a significant inflammatory response, then both the foreign body and inflammation are diagnosed. In the case illustrated above, both the foreign body (hair) and the inflammation (granulomatous) should be diagnosed. A foreign body such as hair or feed material that is passively adhered to an ulcerated surface should not be diagnosed separately; it can be described in the narrative. Deardorff TL, Kliks MM, Desowitz RS. 1983. 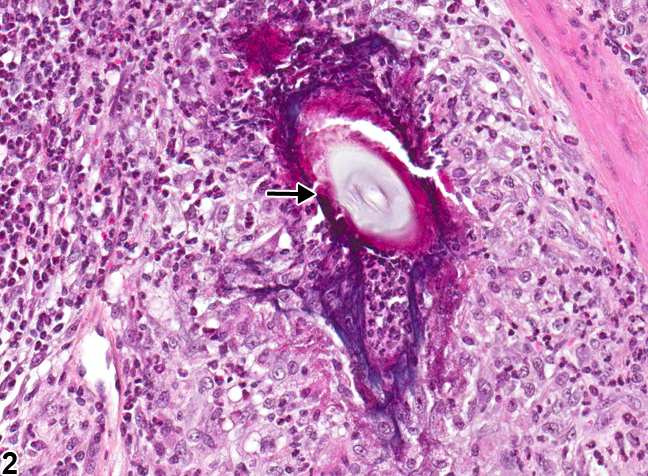 Histopathology induced by larval Terranova (type HA) (Nematoda: Anisakinae) in experimentally infected rats. J Parasitol 69:191-195.